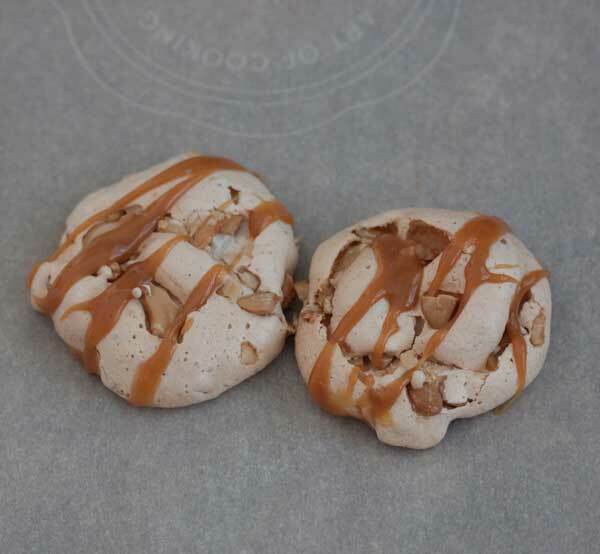 I love all types of meringues, but these Caramel Cashew Meringue Cookies really knocked it out of the park. Along with having the ethereally light, crispy, chewy, texture you expect from a good meringue, they have an amazing flavor combo of buttery cashews and vanilla caramel. The cashews are in the cookie and the caramel is melted and drizzled over the solidified cookies. They look really pretty and freeze quite nicely, and my only regret is that it took me so long to try this recipe! The original version is on allrecipes.com, but I found another version credited to Better Homes and Gardens that used the caramel. The BHG version only called for 4 eggs, but I went with the 5 egg version and was glad I did. Tip: Makes sure your cream of tartar is super fresh. After a few weeks in the pantry it may start to absorb other smells or just develop a weird off smell that can ruin the flavor of the cookie. In a deep metal bowl, beat egg whites and cream of tart with an electric mixer on medium speed until soft peaks just start to form. Beat in cornstarch, then gradually add powdered sugar, about 1/4 cup at a time, beating on medium speed until combined. Beat in a splash of vanilla, then fold in the cashews with a rubber scraper. Batter should be stiff enough so that you can plop it onto the baking sheet, but it will be slightly looser than meringue and might run a tad. Drop by rounded teaspoons (or larger!) about 2" apart onto prepared cookie sheet. Bake for 15 minutes or until edges are very lightly browned. For larger cookies, bake for about 20 minutes. transfer to a wire rack to cool. When cookies are completely cool, peel them off the parchment. If you like a crispier crust and less chew, turn the oven off after your 15 or 20 minutes and keep the cookies in the hot oven for another 10 minutes, then let cool completely. To make the drizzle, combine the caramels and milk in a microwave-safe measuring cup and microwave on 50% power, stirring every 30 seconds. Drizzle caramel mixture over cookies. This is tricky because it's kind of thick. If you want, you can transfer it to a snipped freezer bag or decorating bag, or you can just quickly spoon it on using the very tip of the spoon. Let stand until caramel mixture is set. This is a combination of a couple of different recipes -- one from allrecipes.com and another from Better Homes and Gardens. I made mine slightly larger than the originals and thus, a different yield. The allrecipes.com version says it makes 100 cookies. I made a half batch and got closer to 24, so I think a reasonable estimate is 60 for smaller cookies and 50 for larger cookies. I attempted to make a quarter batch using a little more than 1 egg white, but got a soupy, loose batter. Despite that, I was still able to scoop puddles onto a tray and make thin cookies. So if something happens and your whites will not form peaks, don't give up. Stephanie, the correct amount is 4 cups of sugar as per the original. glad I linked to it so you could see that! I used 2 cups when I halved the recipe, but the full recipe as written should be 4 cups per 5 egg whites etc.. I do think you could cut the sugar down a bit and get good cookie, but the 4 cups (2 when halved) worked perfectly and I didn’t think the cookies were too sweet. Marius, they were sweet but the saltiness from the cashews cut the sweetness quite a bit. You might actually like these. Jessie, the meringues get crispy on the outside (though the are chewy on the inside) and the caramel is set but still chewy. The tiny bit of milk softens it up so it’s not hard, but it’s not so soft that it smears when you pile the cookies. I think I’m going to make another edited and add that I used salted cashews. Fascinating! Had I not seen this picture proof, I never would have thought the caramel would “work” with the meringue mixture. But now that I see it I can’d get it out of my mind. Woah! These are incredible! I do have to say that meringues tend to be a little too sweet for me so I’d have to play with the measures but it still looks incredible! These look fantastic. I see you halved the sugar… are these softer than usual meringues? I did see some comments saying the original version was too sweet. I’m not a meringue person, but the caramel combo sounds delicious!!!!!!!! !